Terms And Conditions For Use Of This Site At Dental Accounting Association, we respect your concerns about privacy. This policy was developed so you may visit and use our site without being concerned about how this information is being used. In a nutshell, we do not and will not sell or rent your information to any third parties. 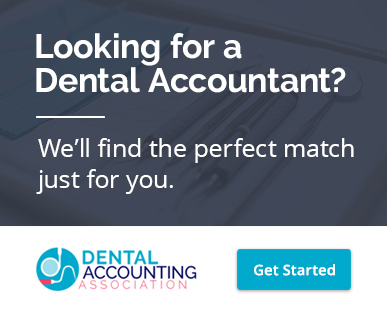 Our sole mission is to connect Dental Accounting Associations members with prospective dentists. If you have any concerns, please contact us. We do not disclose any nonpublic, personal information about our association members or dentists to anyone, except as permitted by law. We give users choice and consent over how their personal information is used and remove names upon request. If you want to modify or delete any personal information you have provided, simply contact us at 888-999-9800 x 151. Third Party Use We will NOT release your name or any information pertaining to your dental practice to anyone other than a dental accounting association member. All our members are licensed CPA firms and operating in good standing. Your email address will not be released to any third party. We will not share with others any demographic information that you may provide us that can be identified as relating to you personally. Copyrights and Trademarks This site as a whole is copyrighted as a collective work, and individual works appearing on or accessible through this site are likewise subject to copyright protection. You agree to honor the copyrights in this site (including the selection, coordination, and arrangement of the contents of this site) and in the works available on or through this site. You may download and maintain single copies of designated materials for your personal use only. In addition, trademarks and trade dress belonging to us or to others appear on or are accessible through this site. The fact that we have permitted you access to this site does not constitute authorization to reproduce our trademarks or trade dress for any other purpose. By submitting any material to us, such as by posting a comment to a discussion group, or by sending to us an email, you are thereby granting to us a non-exclusive license to reproduce, display, distribute, modify and create derivative works from such material and to use such material and the fact of your authorship of it for marketing purposes.